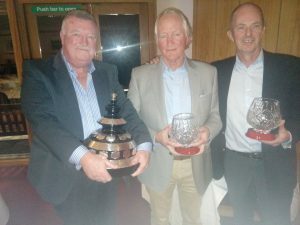 Brophy and Benn win Cress-Marcott – Wanderers F.C. This year’s Cress Marcott played for on the 12th October in the Grange Golf Club has been won by Kevin Brophy and Robin Benn with an excellent score of 36 points. Windy conditions combined with no run on the ball meant the winners struggled over the opening holes , it wasn’t until Brophy decided to stick with his 5 iron off the tee that the pars started to eventually appear. Even with his 5 iron he was outdriving his playing opposition (Murphy and Deane) leaving his trusty partner Robin Benn with the easiest of approaches. Runners up were Niall Crowley and Hugh Hamilton with 35 points and third place went to James Murphy and Brian Deane with 33 points.